Kirk Hammett admits: "I'm never confident"
Metallica's Death Magnetic may have scored the band their biggest album in over a decade, but lead guitarist Kirk Hammett has revealed it didn't come all that easy. 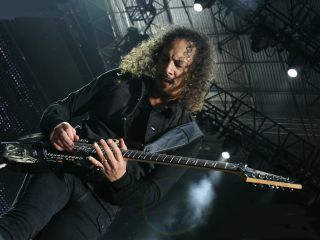 Hammett's extensive soloing has become one of the album's talking points, and the lead guitarist says he sought inspiration in the music he listened to 30 years ago. "When the time came for me to record my solos, I went back to the stuff I used to love listening to when I was a teenager that got my blood flowing," Hammett told Total Guitar. "Old UFO stuff, the Michael Schenker Group, Ulrich Roth solo albums, old Scorpions, the first three or four Van Halen albums, more abstract stuff like Robin Trower, Pat Travers and Roy Buchanan too. And a lot of Ritchie Blackmore! I found myself really getting inspired all over again." And Hammett admits that, despite the praise heaped on his revitalised contribution to Death Magnetic, he constantly questions his own ability. "I'm never very confident," he says. "If a solo comes really easily for me, I question it: 'That was too easy! That must mean that it's not good.' I want it to be perfect. That's unrealistic, but I can't get that out of my head. Hammett adds: "I think, under the circumstances and in the situation, and with the material we were playing with, I did a damn good job. You know, (producer) Rick Rubin's whole deal was, 'Relax! Have fun, enjoy yourself', which were things that we've never done in the studio. Never!" Hammett and James Hetfield talk in much more depth about Death Magnetic in the new issue of Total Guitar, on sale now. Click to buy the November 2008 issue starring Metallica.